The All Ford Day celebrates a decade of being part of the Auckland City’s motoring culture this year. The last ten years has seen the event grow from humble beginnings and few cars at the Jolly Farmer in Drury to now draw attendances well in excess of 500 vehicles and 5,000 people. 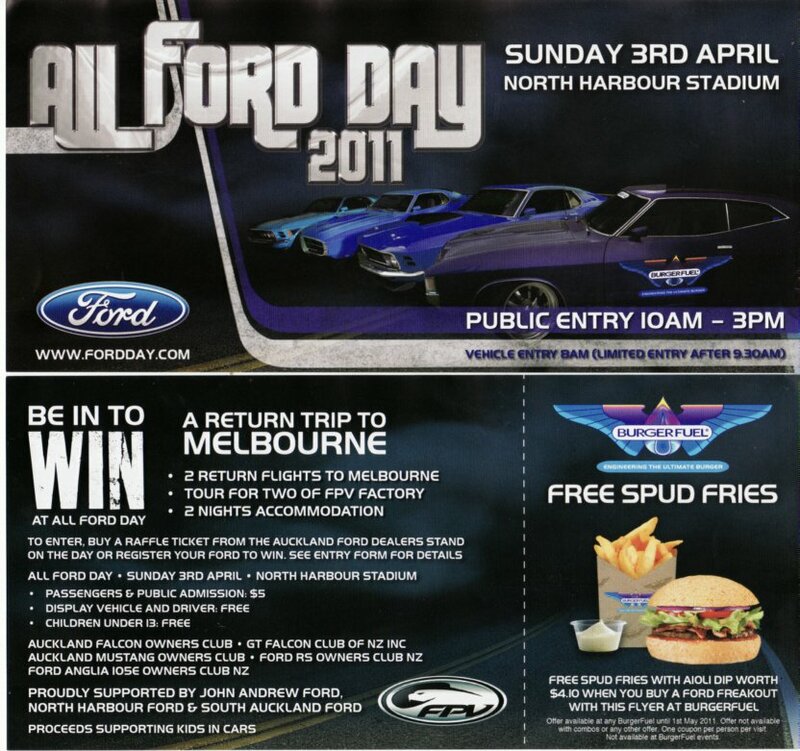 On the back of the enormous success of the 2010 event, North Harbour Stadium has again stepped up to be the host of the 2011 Auckland All Ford Day. We also welcome BurgerFuel on board as a major sponsor. This year the All Ford Day is scheduled for Sunday April the 3 rd, and the sun has been booked! Gates are open to Show Cars and passengers from 8.00am and will be open for public and general admission from 10am through to 2.30pm. Vehicle entry after 9.45am will be strictly limited so get there early to ensure your participation. Entry for Show Cars and driver is free. Passengers and public entry is $5 per person, with children aged under 13 free, when accompanied by an adult. A key benefit of the All Ford Day is that a large proportion of all money raised is donated to charity; this year Kid’s In Cars (K.I.C.) is the primary beneficiary. K.I.C. supports sick, disadvantaged and under-privileged children in the community by providing them with some up-close and personal motorsport experiences as well as any other assistance they can offer. With trade displays, competitions, raffles, spot prizes & giveaways, live music and entertainment, food, fun and of course a guaranteed large display of Ford’s, the day is sure to offer something for everyone. There will be everything from scavenger hunts, carnival rides, face painting & other fun amusements for the kids so bring the whole family along and make a day of it – you won’t be disappointed. There is no doubt about it - the 2011 event is shaping up to be HUGE with over 15 sponsored prize categories for vehicle entrants and many more to be announced. Remember though, you have to be in to win at the All Ford Day, and all winners & their vehicles need to be present at prize giving to accept their prize. Prize giving will begin at approximately 2.30pm. Vehicle Entries – use Stadium entrance off Appain Way. Public Parking available through Stadium entrance off Coliseum Drive (opposite Caltex).